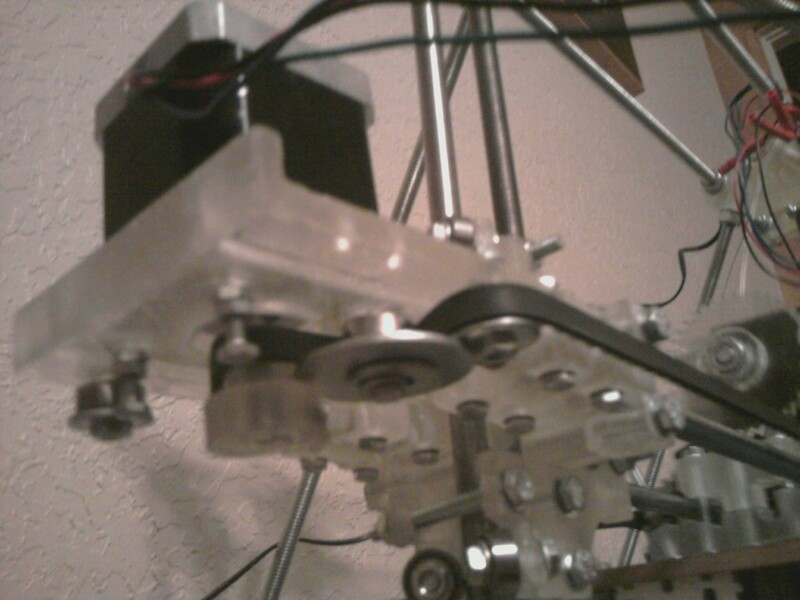 Fixing belt/motor skipping problems on a Mendel. Current settings. Here are some notes for those of you who will be calibrating and resolving possible belt/motor skipping issues. My printer is doing fine at 50mm/s and I haven't tried faster yet. I am using Sanguinololo 1.1 for electronics. I am printing with 1.75mm PLA on a Makergear Plastruder with 0.35mm nozzle. 2) In the configuration.h file of Sprinter there is a value called DELAY_STEP_MICROS or DELAY_STEP_RATIO. I think my motors were skipping because the gcode was coming too fast. I'm not exactly sure why but by enabling DELAY_STEP_RATIO to the default of 0.25 I can get much longer prints without the skipping issue. I may need to tweek this value a little more, but I can't find good documentation on it. I may also try DELAY_STEP_MICROS to 5 or 8 instead of using DELAY_STEP_RATIO. I hope to be at the Discovery Center tomorrow with Dave and Bryan. Check us with or without your printer. Re: Fixing belt/motor skipping problems on a Mendel. Current settings. 50 mm/s! Looks like I'll have to stop spending my time printing prusa parts and get back to calibrating for higher speeds! Seriously though, glad to hear you are printing! So, My skipping issues are not resolved. Current thinking is that it may be my hack of a wiring job causing noise. I will redo the wires and crimp the connectors instead of soldering them. I will make sure wires stay away from power sources and from the endstops. I also ordered an SD board from (http://www.gravitech.us/micaad.html ($15)) to eliminate any possible USB communication issues. When you redo your wiring do 2 twisted pairs to each motor (one per coil)...should help a bit with noise. I redid my wiring including twisting the stepper motor wires in coil pairs. After that I noticed an occasional spark in my x and y axis stepper connectors to the Sanguinololu board. Sure enough, if I moved the wire just right I would get the spark and the motors would not react. I redid the connectors again. Maybe I should just invest in a proper crimping tool. Anyways, things seem okay for now. But I haven't tested it that much since I decided to replace my molded x-axis motor mount with a proper printed one that didn't sag. I hope to be printing again tonight. But... I have the same one, I'll bring it to the next meeting. You are very lucky, a spark is usually enough to destroy Allegro stepper controllers. Bryan, it would be great if you could bring the crimp tool to the next meeting. I'm sure I won't be the only one who has this issue. Having more trouble than I anticipated with my new Ramps board. Despite having adjusted the current on my driver boards to the point they start getting really warm and adding step_delay_micros 3 to the firmware, I get drift in the layers. Each axis can push a fair amount of resistant force before it is stopped. Running out of ideas here, I've been thinking of slowing the print speed down to 40 mm/s just to see if that calms it down too. Anybody have some advice or feedback? Definitely reduce the feed speed - maybe even down to 25. Have you tried different host software, just to see if something else reacts differently to the same G-Code? Changing the steps delay micro didn't help when I was having issues with skipped steps midprint (when I tried sprinter that is). On my machine I had to lower the firmware acceleration (Marlin/Gen6). My main issue I was having was that on small repeated moves the machine would try to shake itself apart and eventually skip steps...lowering the max acceleration helped smooth things out a lot, it was just getting up to max speed too fast for the small moves. Heh - I was just about to add to this thread with a mention on acceleration in the firmware, based on the other thread you just posted in. Here are the current default values from Configuration.h, for quick reference and comparison with your settings. I will say mine are working, as I've never had a skipped step that was software related (plenty of physical obstacles that cause some though). // X, Y, Z, E maximum start speed for accelerated moves. E default values are good for skeinforge 40+, for older versions raise them a lot. This is for my Sells Mendel with Gen6. I could run faster most of the time but there are certain moves which cause massive skipping if I try to run faster. I am also printing at default sfact/slic3r speeds, printing in Pronterface. I do not have advance enabled. When I tried to lower the acceleration settings too much in Sprinter I had a ton of serial errors...I am probably doing something I am not supposed to. I was planning on working on that later. There may be some mechanical issue that I am just correcting by lowering speeds...could be a Gen6 thing too. The buzzing I was talking about in the other post happened if I tried to run my Z speeds too high the steppers would just buzz...again, there is probably just a mechanical issue that I am masking. Edited 1 time(s). Last edit at 11/21/2011 12:32AM by C. Cecil.